This blog is about bicycles and other ways to get around from point to point. Recently, we visited Yosemite National Park. Besides the always-wonderful scenery, I noticed bicycle and pedestrian approaches that were both enlightened and somewhat odd for non-motorized visitors. First, I noticed that the loop road to see Half Dome was closed to motorists. 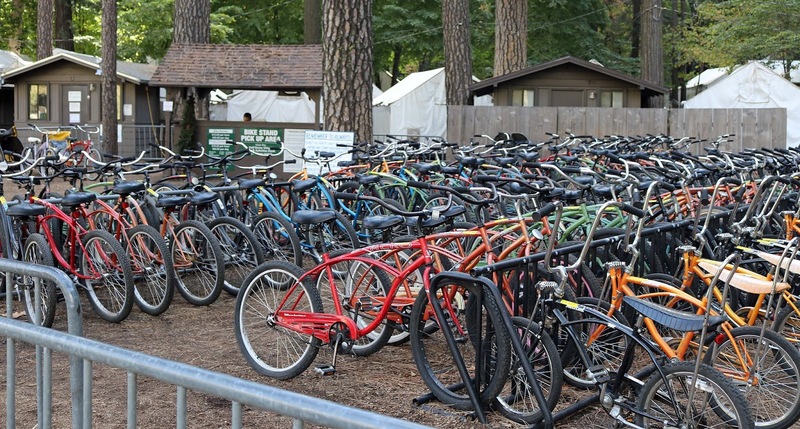 In addition, there were LOTS of bicycles for rent. Even though this was October, there were lots of them getting rented. 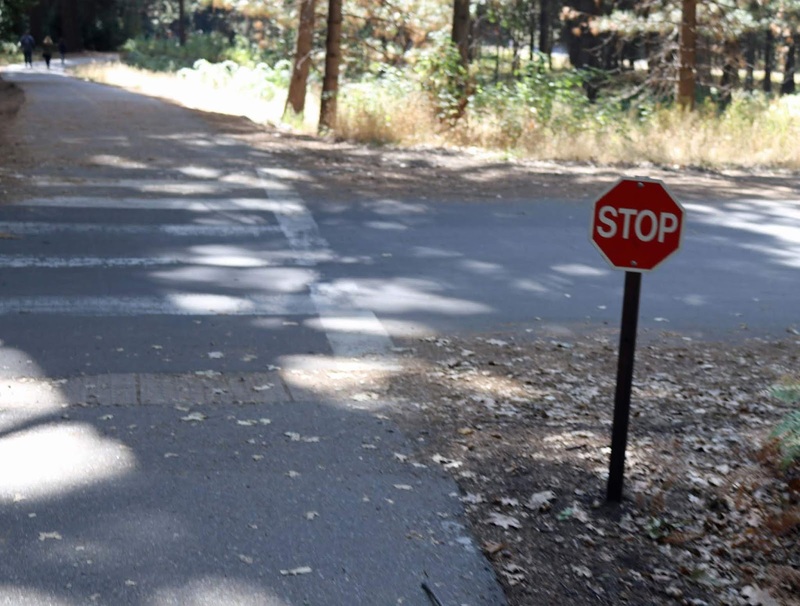 Second, I was struck by a STOP sign on the path to the Visitor center. It seems odd, and a bit antiquated, to expect the vast majority of travelers to actually come to a full stop just in case the occasional bus might be coming by. In truth, nobody stopped at the sign. Of course, there wasn't any protected tour buses nearby. This is a case where a "Yield" sign might make sense, especially with an advisory sign underneath that notes "Tour Buses might be passing at any time." How Many Pedestrians do YOU Know that Would Come to a Full Stop Here before Proceeding? Just noticed a local sign "telling" cyclists to dismount whilst on the cycle track because a new car wash has been allowed to open on a sliver of land alongside and motorists cannot be expected to be slowed down entering or leaving! Cyclists are reminded constantly they they are the lowest tier of infrastructure user. Sometimes they're grappling with pedestrians for that bottom spot, but the fact that people walking or pedaling get lumped together at all indicates the myopia that afflicts planners once they drop their eyes below the lowest rank of motorized vehicles. Stop signs like this provide a rock-solid defense against liability if a cyclist gets injured or killed. "Dismount and walk" signs are all over the Cotton Valley Trail in New Hampshire, because they're way cheaper than solving the user conflicts that require the rails to be left in place, and the trail to wind in and out between and beside them. Injuries to riders -- some of them serious -- have had no effect except to make the markings and warnings at the crossings more flamboyant and annoying. No Need for Non-Robot proof here! Amended 5 Foot Bill Vetoed, Gov Lujan-Grisham Says Come Back Soon and Fix It - Sez it all. Thanks to Santa Fe New Mexican reporter Andrew Oxford for tweeting this out. Maybe this picture explains the language in that veto letter. Mostly it's about local transportation cycling, as it exists in the here and now. It's got a smattering of other gratuitous toy recreation thrown in to keep y'all a little off balance. For those that don't know me, toy recreation means English & Italian cars, aircraft - and downhill skiing. I get grumpy once in a while. I do a little bike riding. It's the next best thing to skiing, but there's not a lot of that around NE Tarrant County.